Case Titles can be created in Nookal to streamline the case assigning process as well as for internal reporting. 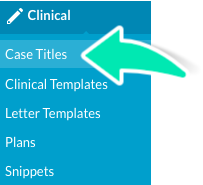 Once created, users can select a specific Case Title from a dropdown list when creating new cases. See steps below on how to create Case Titles. 2. Click Case Titles under Clinical. 3. In the bottom right hand corner click Add Case Title. 4. Add Case Title name. 5. Select Locations where this Case Title will be available. 6. Select the Type of Case this Title can be used for. 7. Set the Status as Active. Once saved, the Case Title will be displayed in the List of Case Titles. It can be modified or made inactive at any time.